I guess another way of dealing with the dance elements in baroque opera is to dance the whole thing. That’s what Mark Morris Dance Group do with this 1995 version of Purcell’s Dido and Aeneas. 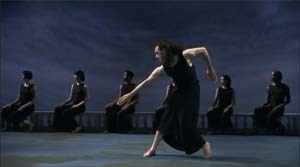 The work is performed as a modern dance piece with the singers off stage. 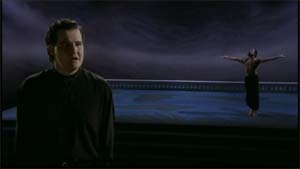 As it’s a film rather than a record of a live performance, the singers can be, and are, occasionally pulled into the visuals. The piece is played out on an elegant blue and grey stage and backdrop with a (very) few white props as required and all the dancers are dressed very simply in black so the look is very spare but very elegant. The choreography (by Mark Morris) is of a school of modern dance that I don’t really understand. It’s almost like a parody of one’s idea of modern dance. At times overly literal, at others very jerky and inelegant. It certainly doesn’t have much in common with ballet, even of the more abstract modern variety. In this case it’s not helped by Morris himself dancing both Dido and the Sorceress. Some might find this bold and exciting. I think he just looks like a very unconvincing transvestite and I’ve see more than a few of those! So, no, this approach doesn’t work for me. Musically it’s not bad. Jennifer Lane sings Dido and the Sorceress. She’s fine as Dido though not in the same class as Connolly or Ewing. She, along with the two witches, witch it up more than I care for in the witchy bits. Russell Braun is Aeneas and he’s more lyrical and less gruff than is often the case. The Belinda is Ann Monoyios and, to be honest, she doesn’t sound entirely secure in the role. Mercury is sung by a soprano (uncredited) which is a bit odd and jarring. Tafelmusik supply the orchestra and chorus and are as good as you might expect. I think Jeanne Lamon is conducting but it’s not entirely clear from the disc or the package. The filming is very good with the singers and chorus being effectively, if infrequently, inserted into the picture. The video quality is standard DVD with hard coded English subtitles. Dolby 2.0 is the only sound option. Documentation is minimal. I think this one is strictly for the Mark Morris fans. This entry was posted in DVD review and tagged braun, lamon, lane, purcell, tafelmusik by operaramblings. Bookmark the permalink. I agree the dancing’s a bit odd, and Mark Morris dancing both lead parts reeks of egomania and detracts from the production, but it’s my favourite DVD of my favourite opera.